Extra large AVJ Series Cart. We took our top selling AVJ series cart and made it slightly larger. Our new XL series features shelves that are 32"w x 20"d. All steel cart that is adjustable in height from 24"-42"h. Cart adjusts in 2" increments. 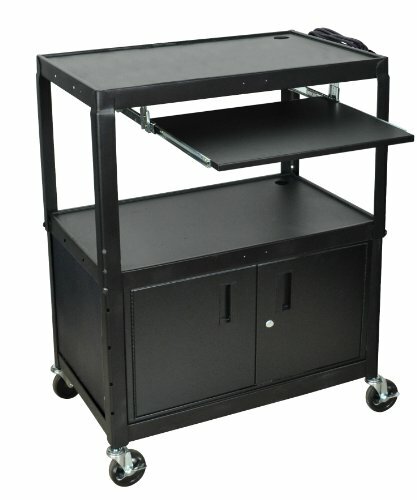 Cart has a locking cabinet for storage and pull out keyboard shelf. Unit features a 3-outlet surge suppressing electric assembly. Shelf clearance between the bottom to middle shelf is 14 3/4"h. Cart features a 1/4" retaining lip around each shelf. Black Powder Coat Finish. Cable pass through holes in top and middle shelf. Includes keyboard shelf and locking cabinet.